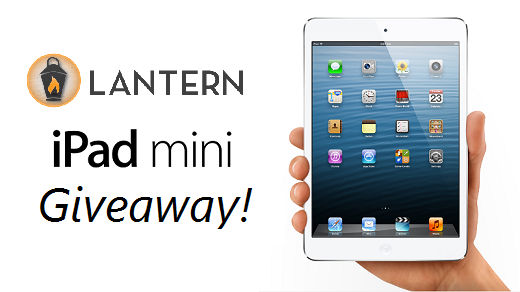 Lantern Software iPad mini Giveaway! UPDATE: Congrats to our winner, Mary Komosa! Enter to Win a Free Apple iPad mini! It’s quick and easy! Any new or existing Lantern user who signs in between 4: 00 pm/CT (April 25th) through 12: 00 pm/CT (April 26th) will be entered to win an Apple iPad mini. There are no games, purchases or hidden stipulations to enter the contest other than simply signing in to the free Lantern app. The winner will be randomly selected at 12:00pm/CT on April 26th and notified via email and social media. Be sure to tune in to 101 The Fox tomorrow (April 26th) morning at 8:15am/CT as Lantern CEO, Aaron Sloup, will be a guest on the Slacker Morning Show. Aaron will be talking with Slacker about some exciting things happening at Lantern and there might even be some other giveaways from great Lantern merchants during the show. The Slacker Morning Show airs between 5:00am/CT and 9:00am/CT. No purchase necessary, void where prohibited. Must be at least 18 to enter. Winner will be contacted via the email provided. The prize is a white, 16GB, WiFi, Apple iPad mini. Lantern CEO quoted in Inc.
By 2022, IoE to Become World Superpower Economy? !